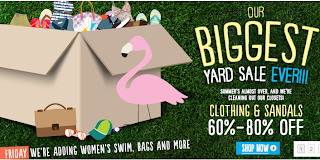 Children's Place 25% off Today, 20% off tomorrow Free Shipping no minimum PLUS CASH BACK! 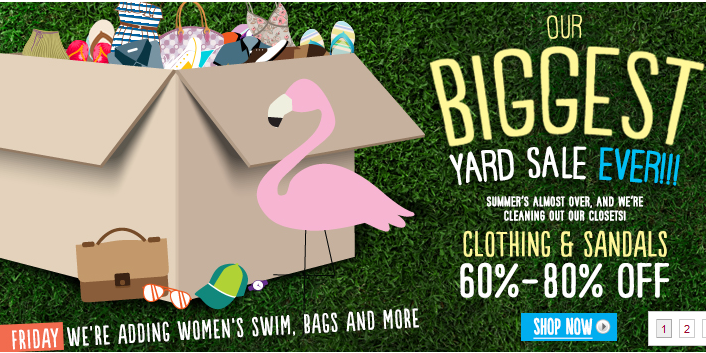 Children's Place is having a great sale this weekend. 20% off your entire purchase use code SAVE20 - Sunday only. Plus FREE SHIPPING with no Minimum purchase required. 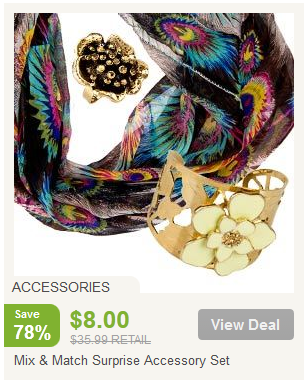 Shopping online be sure to go through EBATES and get 2% cash back! plus new members get a Free $10 giftcard of your choice at sign up when you spend $25 with in 90days! If you dont want to shop online you can PRINT COUPON to redeem in store. **GONE** HOLY SMOKES PRINT THIS NOW! $3.00 / 1 Lays 10oz or larger! I have never seen this high of a value coupon for Lays! PRINT THEM NOW while you can! ALL 3 Coupons are no longer available :( =those went super quick! Walgreens Friends and Family Event 15% off store items 20% off 20% OFF all Walgreens, W Brand and Nice products! Aug 29th only! Walgreens is having a Friends and Family Event Wednesday August 29th only! you must PRINT YOUR COUPON in order to redeem this special savings. If your on the go or dont have a printer you can text the word FAMILY to 21525 and receive the coupons on your phone! for more info visit the Friends and Family Event page! *Valid in Walgreens stores on Wednesday, August 29, 2012 only during regular store hours. Offer not valid on prescriptions, cigarettes, dairy products, liquor, liquor department items, phone cards, newspapers, magazines, stamps, gift cards, HME and DME products, items or services submitted to insurance for reimbursement or where otherwise limited by law. Also not valid toward Prescription Savings Club membership fee. Limit one coupon per person per purchase. Coupon must accompany purchase. Copies of coupon are void. 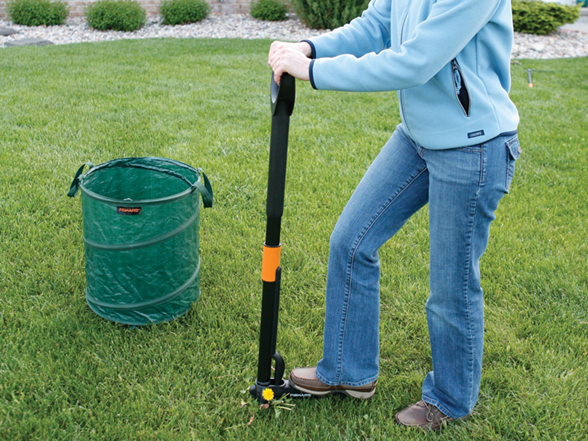 **Coupon code FAMILY15 valid up to three uses per customer on Wednesday, August 29, 2012. Code must be entered at time of checkout to apply discount. Discount does not apply to pharmacy, contact lenses, photo orders, electronics, gift card purchases, taxes or shipping charges. Shopping carts containing Contact Lenses and/or Electronics Tier products are ineligible for the FAMILY15 promotion. Contact Lenses and/or Electronics Tier products should be placed in a separate order. Orders must be placed by Wednesday, August 29, 2012 at 11:59 p.m. Central Time to qualify. Timing will be determined by Walgreens server clock. Offer valid online only. HOT New Printable Coupons from Coupons.com & Coupon Network! Milk Unleashed. Wholesome goodness. Anytime, Anywhere.Shelf safe milk is Grade A fluid milk that requires no refrigeration until the package is opened, thanks to ultra pasteurization and special Tetra Pak cartons that preserve all the wholesome goodness of milk. Now kids can get the vitamins and nutrients of milk anytime, anywhere. What are the Benefits of Milk Unleashed? Anytime, Anywhere.Grab ‘n go wholesome milk for your family. No need to give up on nutrition just because you’re on the mooove. Shelf safe milk is great in lunch boxes, sport coolers, diaper bags and purses. Try freezing them, so by mid-day they're just the right temperature. Milk Unleashed goes wherever your family goes! WHERE WILL I FIND SHELF SAFE MILK IN MY STORE? On the shelf with no need to refrigerate. Woot: Fiskars 1399 Deluxe Telescoping Weeder $17.99, which is 64% off the $49.99 list price. Philips Fidelio DS7700 Speaker Dock for iPad, iPod, and iPhone $119.99 (40% OFF)Compact and extremely portable, the Philips Fidelio Docking Speaker with Bluetooth is no lightweight when it comes to performance. Designed to travel and fit any iPad, iPhone, or iPod, it delivers powerful sound, so you can enjoy great music wherever life takes you. Its slender design fits into your briefcase, backpack, or suitcase, and its built-in rechargeable lithium-ion battery gives you up to 10 hours of music playback. Free Blogger Opp for all your True Blood Fans. Cost is free with post, and addition links $1. 1- Blast O' Butter Ultimate Theater Style. My family has been forever JOLLY TIME Pop Corn fans! JOLLY TIME is a 4th generation family owned business. Located in our home town of Sioux City, IA, and employs about 185 popcorn connoisseurs. You can "like" JOLLY TIME on facebook. Kids are, especially after school – so why not let them indulge in delicious, convenient JOLLY TIME Pop Corn? With the mini bags, there is just enough for a quick and fun afternoon snack. JOLLY TIME Pop Corn is the perfect after-school snack that satisfies kids’ hunger. With a selection of delicious 100-calorie Healthy Pop® varieties – including sweet-and-salty Kettle Corn and rich Butter Flavor – both kids and moms can feel good about whole grain and gluten-free snack options. Here is an example of a regular size package and the Mini Bags. The mini bags are perfect size for a back to school snack. enough popcorn for 1 or 2 of your little ones to enjoy with nothing going to waste. We purchase a big 30ct value pack once every couple months from Sam's Club. but like I said our family loves JOLLY TIME Popcorn! Sometimes we spruce it up a bit and add M&M's, turning it into a salty, sweet, chocolate, & crunchy all in one yummy snack. If you want some fun ways to Spruce up your JOLLY TIME popcorn you can check out JOLLY TIME Recipes on their website. Capri Sun's around $1.00 eac after Printable Coupon at Walmart! 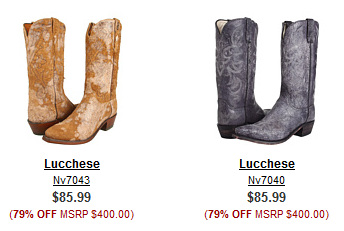 6pm is having their "Biggest Yard Sale Ever" with clothing and sandals up to 80% off.. plus, Lucchese boots, just $85.99... I've seen these at the mall and fell in love! Great price to snag them at! 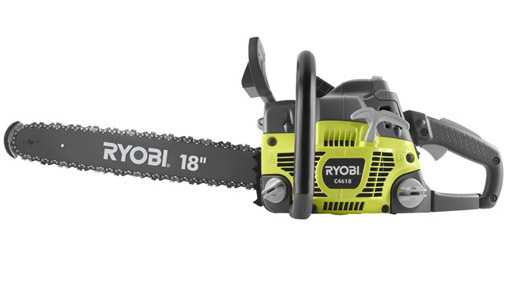 Be sure to go through Shop at Home for up to 5.75% cash back on your 6pm purchase! 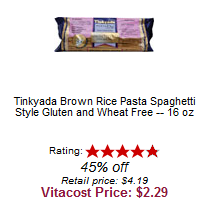 Vitacost: Get $25+ of groceries shipped for FREE, plus save $10 extra! 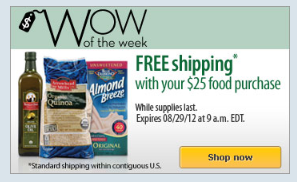 Get FREE shipping when you spend $25 or more on food items on Vitacost. If you haven't signed up for Vitacost yet, here's a FREE $10 from me to shop with! 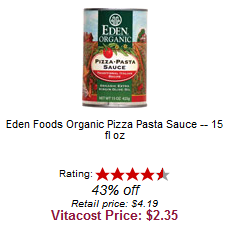 This means you can get 6 of these gluten free pasta and 5 sauce Tinkyada Brown Rice Pasta Spaghetti Style Gluten and Wheat Free 16 oz at $2.29 each (45% savings) and 5 of these Eden Foods Organic Pizza Pasta Sauce 15 fl oz at $2.35 each (43% savings) for $25.49, but after $10 coupon, just $15.49 shipped. Go through Shop at Home and earn 9% cash back on your Vitacost order! Remember, here's $10 for you!